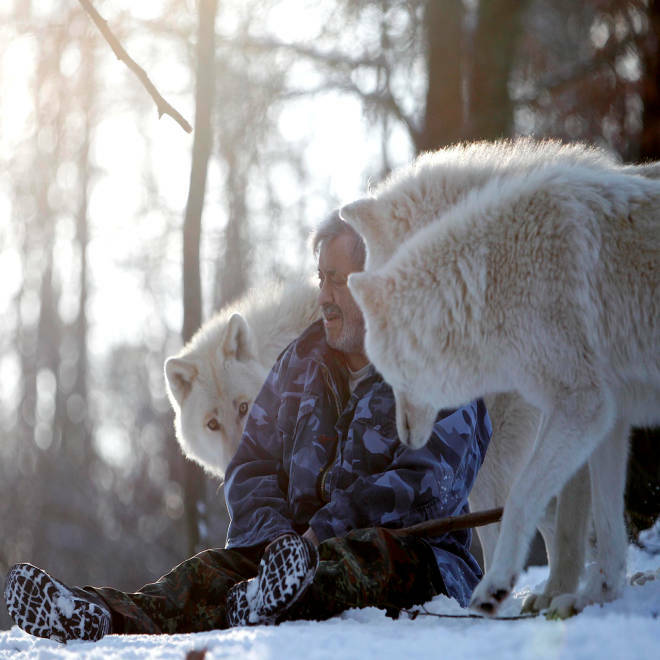 Wolf lover Werner Freund has been accepted into the pack. 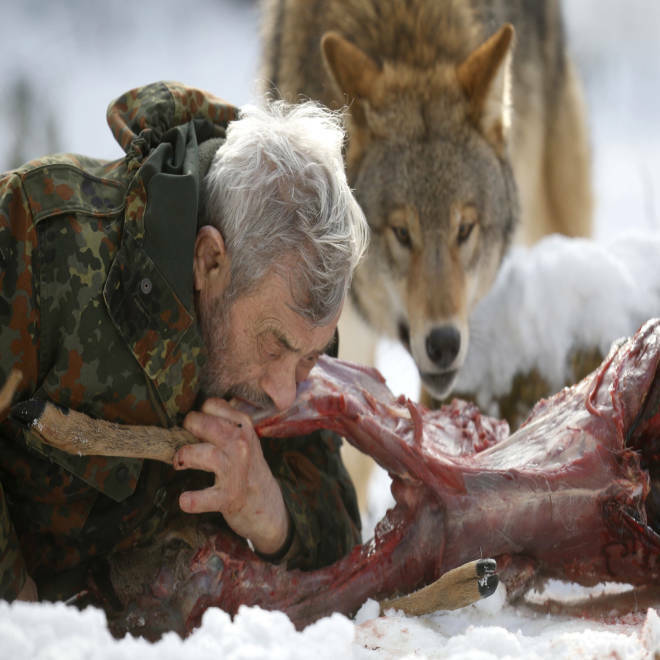 Werner Freund doesn't dance with wolves to get close to them — he feeds them raw meat from his mouth. 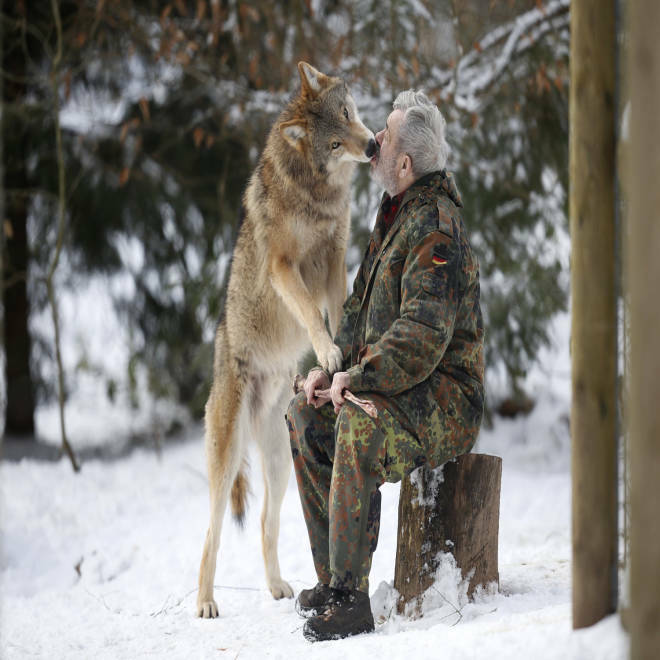 The 79-year-old German wildlife conservationist has dedicated his life to observing wolves, adopting their behaviors as closely as possible to be accepted into their packs. This includes howling, biting into animal carcasses, and letting wolves lick his face, Reuters photographer Lisi Niesner discovered when she recently visited Freund at the snowy sanctuary where he bonds with the animals. 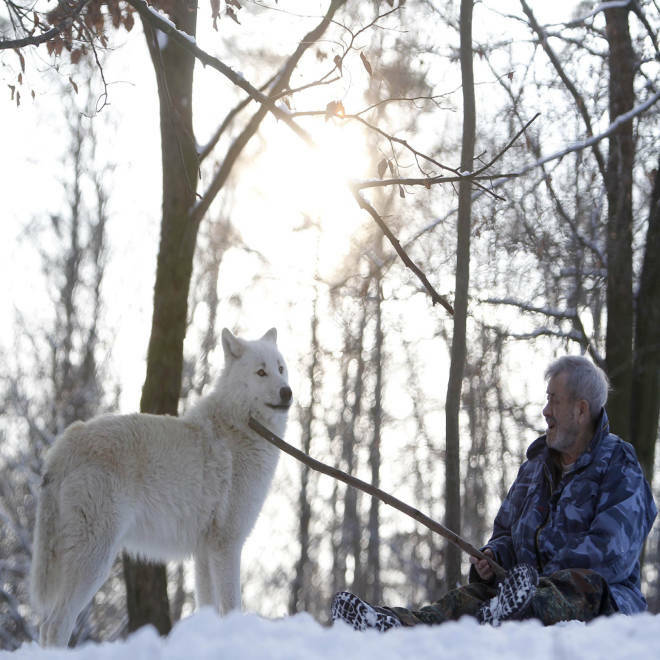 Freund strokes Arctic alpha wolf Monty with his walking stick. "People said, I am half human," Freund told the photographer of his relationship with the wolves, according to a blog post she wrote about the trip. He was quick to clarify, noting that despite his habits, "I have always remained human." Mongolian wolf Heiko licks the mouth of wolf researcher Werner Freund in a sign of acknowledgement. 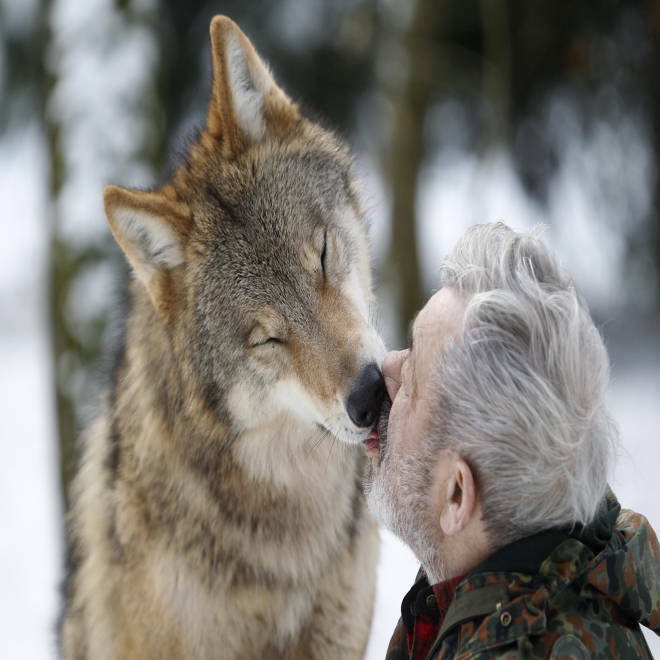 Freund runs a wolf sanctuary known as the Werner Freund Wolfpark in the small town of Merzig, Germany, where he has won the trust of nearly 30 wolves. “To earn their respect, one must become a wolf, and that is what I am to them – their leader,” he told the Telegraph in December. Freund says he has been accepted by the wolves as their leader. In a series of stunning and slightly disturbing photos, Niesner captured Freund at work in the wild, where he has convinced the wolves he is one of them. His daily routine includes howling in the snow, holding raw meat in his mouth to entice the wolves, and chewing deer carcasses alongside them. Niesner also captures the wolves licking Freund's mouth, which she describes as a "sign of acknowledgment and a sign of membership of the pack." Freund bites into the deer carcass, behaving as the wolf alpha male of the pack to earn the other wolves' respect. 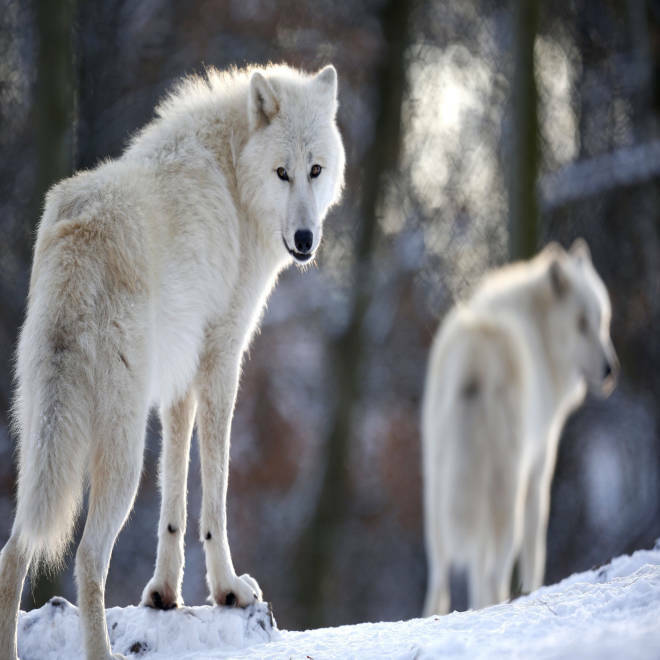 Freund, who served in the German military and worked as a gardener and a zookeeper, adopted his first wolves in 1972 with his wife Erika, who he has been married to for 50 years. They started with a wolf from Yugoslavia, who mated with a female wolf and spawned a set of cubs, launching a lifelong obsession for the couple. "I had to become a wolf to bond with the wolves," he told the Telegraph. "That is the only way to gain their trust." 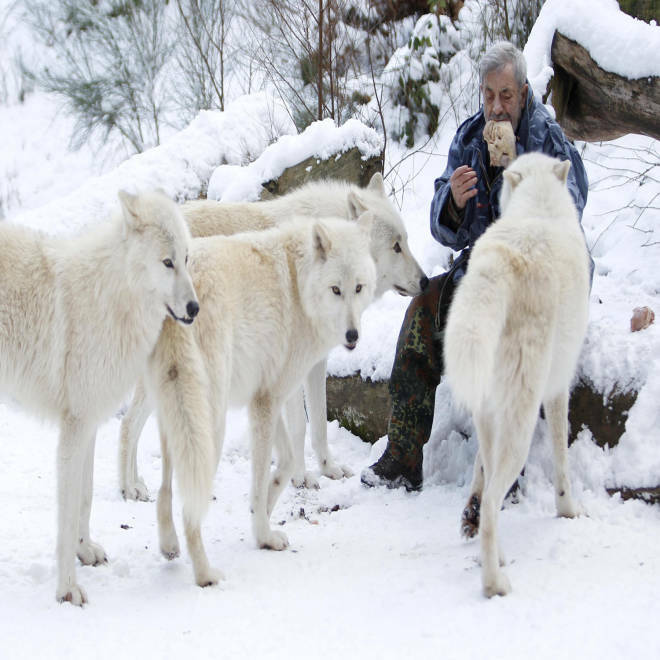 Freund feeds Arctic wolves with meat at the wolf sanctuary. Though he cautions that wolves will never be domesticated like dogs, Freund says there's no reason to be afraid of the animals. "There will always be farm animals taken by them. There will always be 'incidents' because of their proximity to man," he said. "But truthfully? You are more likely to die from meeting a werewolf than a real one. They don't want to know about humans. They want to do their own thing." Freund has raised more than 70 animals over the last 40 years. Having worked with wolves for 40 years, Freund is now seen as an expert on the animals and his preserve is very well respected. "Fairy tales, that's what gave them a bad name," he told the Telegraph. "Red Riding Hood and all that... I battle to strip away the myth of the 'dangerous wolf.' Look, dogs around the world kill plenty of people a year and bite millions more. Dogs have lost their fear of humans, the wolf hasn’t. I only get close to them because they know me; a stranger couldn’t do what I do." 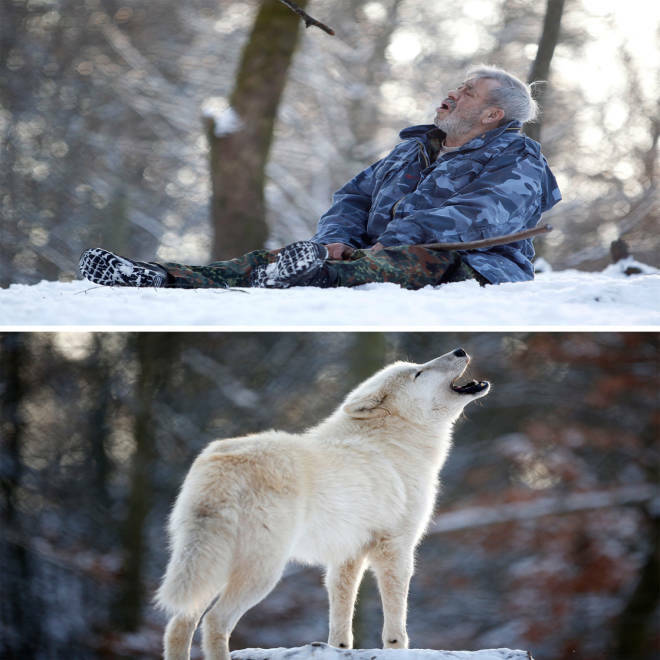 Wolf researcher Werner Freund howls while sitting in an enclosure for Arctic wolves at Wolfspark Werner Freund, in Merzig in the German province of Saarland on January 24.